Chennai, formerly known as Madras, is one of the oldest cities in the South. It was formed when the British bought land in the province of Tondaimandalam and built the Fort St. George. Eventually, they annexed all nearby villages into what would soon be called Madras. It is only recently that the local governments made the decision to rename the city to Chennai in an effort to abolish the British influence on India. And, while they surely took care of that, Chennai’s own cultural influences still breathe deep in its many architectural marvels. The south of India is very fond of building temples, as is demonstrated by the many that have been erected in honour of famous actors. But Tamil Nadu, in particular, is known as the land of the temples, for even within southern states Tamilians are remarkable sculptors. And Chennai is no exception to that rule, being the capital of Tamil Nadu. In fact, one would be hard pressed to not find one around every other corner of the city’s streets. 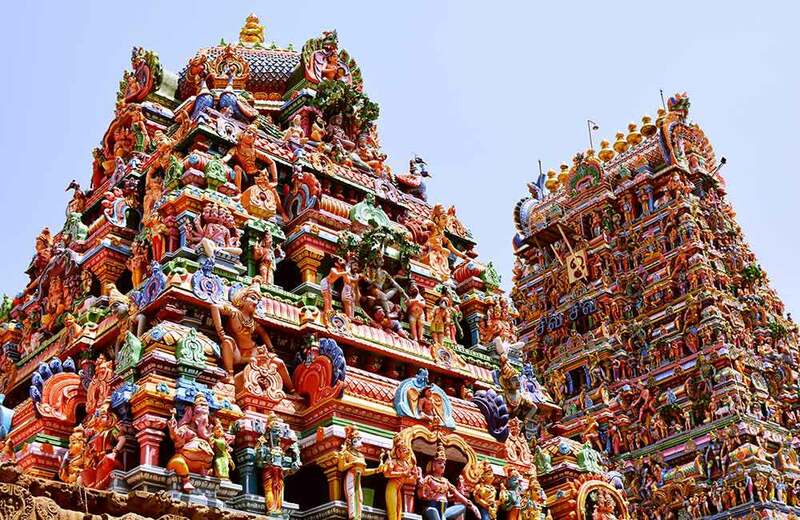 Now, with that knowledge, it is clear that to truly appreciate a city like Chennai and its long history, it is important to visit the best of its many temples. And here, we are going to do just that! So, without further ado, let’s go on a holy pilgrimage of sorts, shall we? The Kapaleeshwarar temple is located in the Mylapore area of Chennai, which is named after Lord Shiva himself. Historically, people of this region worshipped Lord Shiva in the form of a peacock, which is called Mylai in Tamil and is the origin of this area’s name. In the Kapaleeshwarar temple, however, it is not Lord Shiva who is the star of the show. That honour has been bestowed upon his wife Parvati, who is worshipped here under the name of Karpagambal. The original temple was destroyed by the Portuguese in the 1500s and had to be rebuilt in its current location. And while that is not necessarily a happy event, it did create the stunningly intricate temple that exists today. 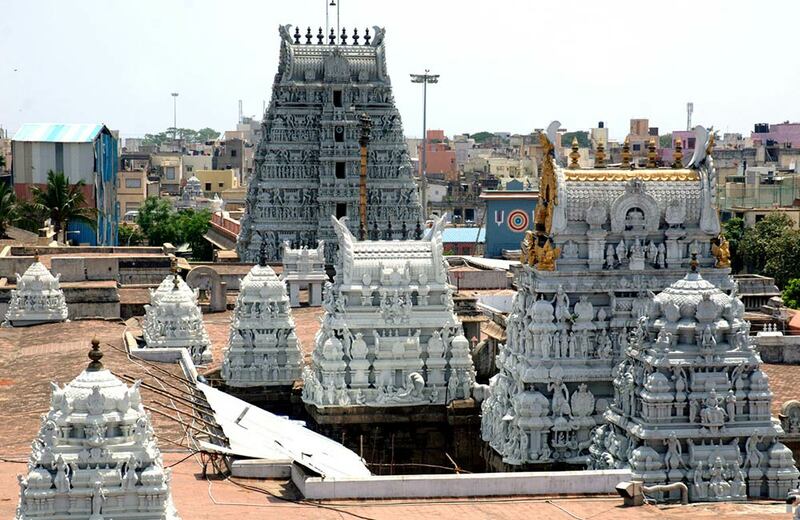 Being one of the most ancient temples in Chennai, it is also one of the most visited temples in the city. So, if you are trying to get a good look, it is best to visit early! Built in the 8th century, this temple is one of the oldest temples in Chennai and has been a staple in any list that details the temples of Chennai. As might be obvious to anyone who knows some lore about Lord Krishna, this temple is named after him. In the Hindu mythological text Mahabharata, Lord Krishna acted as the charioteer for the Pandava prince Arjuna. And it is in this very role, that he recited the entirety of Bhagwada Gita, which is now one of the biggest literary exports of India. Due to structural damage, this historic temple is undergoing a huge renovation, and some parts of it are not accessible to the public. But that doesn’t mean that you should miss out of visiting this historic temple. Additionally, it is also one of the preferred temples in Chennai for marriage as you will find if you visit early in the mornings! So get married or attend some stranger’s wedding while appreciating the beauty and heritage of this monument! Located in one of the longest-standing regions of Chennai, Tiruvottiyur, the Thyagaraja temple is dedicated to Lord Shiva. 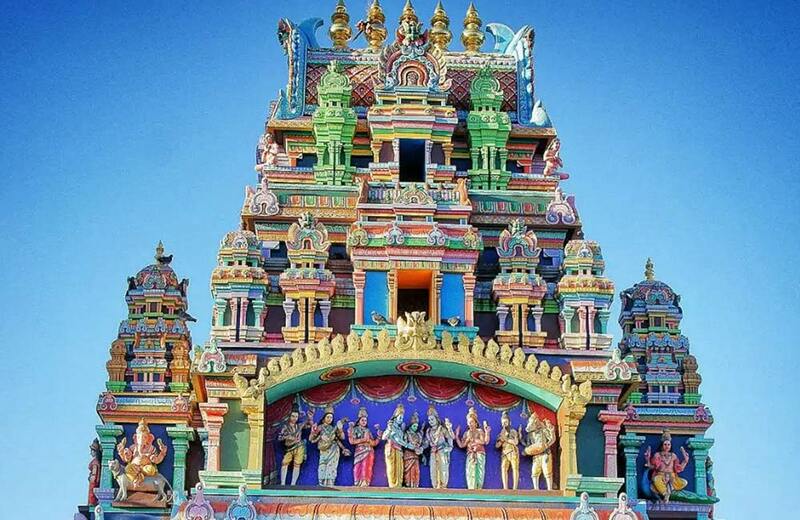 One of the most famous temples in Chennai, this temple is also one of the biggest in the country, with about 33 acres of expanse to its credit. Consisting of four gateway towers, also known as Gopurams, it is filled with shrines to a number of deities from Hindu mythology. Another very interesting fact about the temple is the chariot that the thousands of devotees pull out of the temple every year. During the Tiruvarur chariot festival, about 10,000 people are required to pull the largest chariot of its kind in Asia that carries in it the statue of Lord Shiva. The chariot weighs around 300 tonnes and stands taller than 90 feet vertically. If you ever get the chance to visit Chennai in April, this is a sight worth watching! The word Ashtalakshmi is derived from the name of the Hindu Goddess of wealth and prosperity, Lakshmi. Ashtalakshmi means the 8 types of wealth that are desired by all devotees who worship goddess Lakshmi. Each of these types of wealth are represented as an incarnation of Goddess Lakshmi in this temple. They are Gaja Lakshmi, Dhana Lakshmi, Santaana Lakshmi, Dhaanya Lakshmi, Dhairya Lakshmi, Adi Lakshmi, Vijaya Lakshmi, and Vidya Lakshmi. As you go around the temple you will see each of the Lakshmis represented differently in their respective abodes. Having been built in 1976, this temple consolidates both Dravidian architecture and contemporary architecture. It is conveniently located on the Elliott beach, which is just another reason to visit this beautiful monument to the Hindu Goddess of wealth! 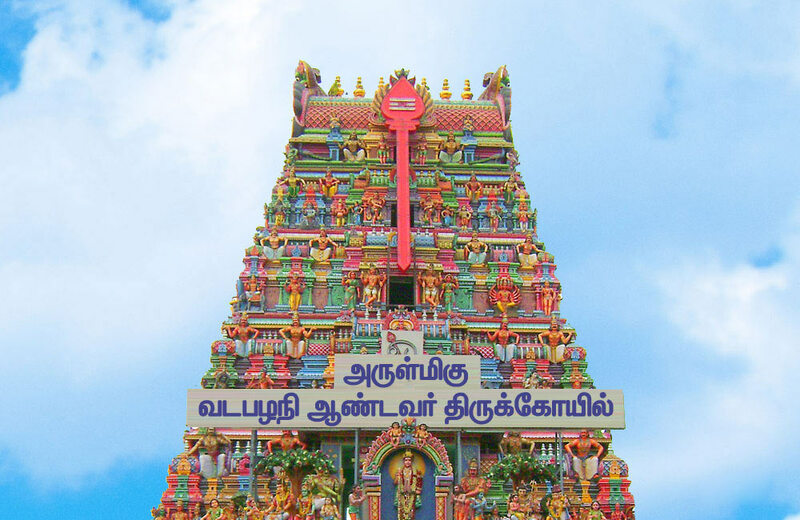 This temple was built in honour of Lord Muruga or Kartikeya as many Indians known him. He was the son of Lord Shiva and Mother Parvati, and the brother of Lord Ganesha. In the southern parts of India, Murugan is worshipped as the God of War. It is rumoured to have started off as just a small shed dedicated to Lord Muruga by Annaswami Nayakar, a devout follower of the Hindu God. Over the years, it has been one of the most common temples in Chennai that are used for the purposes of a marriage. Some estimated 7,000 couples marry at the Vadapalani Andavar temple annually. The gates of the temple are covered in stucco art that depicts several legends from the ancient text that details Kartikeya’s life. It is called the Skanda Purana. It had to be renovated again in 1920s where it grew bigger as well. It has also been made famous by the life-long care of Shri. V.A. Sundara Gurukkal. If you are in Chennai and are looking to tie the knot, then look no further! Get to the Vadapalani Andavar Temple and take the plunge! A very interesting myth is attached to the history of this temple. People in Chennai, and many other parts of South India, believe that this temple can aid in finding a groom for an unmarried woman. A Devi by the name of Kamakshi Amman apparently closed Lord Shiva’s third eye in a fit of playfulness and the whole world plunged into darkness. When the matter was resolved, she begged Lord Shiva for forgiveness and he asked her to commit to penance. 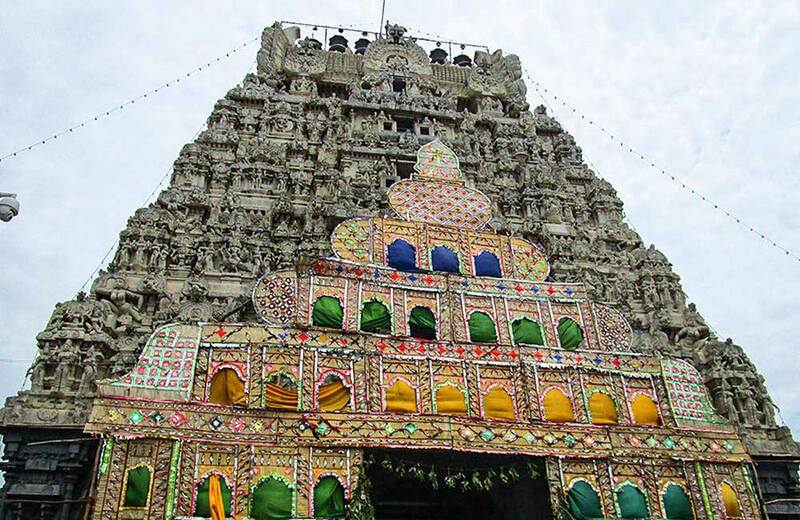 For the site of her penance, Kamakshi Amman chose the very place that this temple is built on. The legend says that Lord Shiva was so impressed by her severe penance that he appeared before her and granted her the boon of being his wife. Based on this story, the belief goes that unmarried women who worship Devi Kamakshi Amman with true sincerity at this temple get blessed by her. She removes all obstacles in the path to marriage and they get married fast. Well, whether you are superstitious or not, it still is a beautiful temple to visit and get married in! The Kalikambal temple is located in Parry’s Corner which used to be called the George Town area of Chennai. It is yet another temple that is dedicated to the Devi Kamakshi, however, she is worshipped not as Kamakshi but as Shri Kalikambal here. It also celebrates the divinity of Lord Kamadeswarar. Today, this ancient place of worship is surrounded by tall buildings built on the prominent financial district of Chennai, the Thambo Chetti street. An interesting fact about this monument is that it used to be in a completely different location which was close to the sea. It was relocated to where it is now in 1640 AD. It is also worthy of note that Maratha King Shivaji had worshipped here during his lifetime whilst incognito. Wouldn’t you like to touch the same walls that Chattrapati Shivaji himself touched centuries ago? This temple sits pretty beside the Redhill lake by the Grand Trunk road which just so happens to be the road that connects Chennai to the rest of Tamil Nadu. It is for this very reason that it is also known as the “Gateway to the South”. The Jain community in India is especially fond of this shrine as it was built to honour their first god Lord Adeeswar, or Adi Bhagwan, or any of the many names that he is known by. Tirthankar Rishabhdev, which was his given name, is believed to be the person who started the religion. But Jains believe their religion to be timeless, existing far before any Hindu gods existed. Which can also be said about this temple as it is believed to have been built as early as the 1st Century BC, about two thousand years ago. Whether you are Jain or not, to visit this temple is a feast to the senses with the intricately carved Jain architecture depicted here! The Ayyappan temple was the very first Ayyappan construction in the city. It was built in 1974, instantly becoming a favourite place for many devotees. A lot of the residents that lived near the Mahalingpuram Ayyappan temple used to migrate to the Sabarimala during the Mandalam Makaravillakku seasons. To keep them there the idea of building this monument was conceived and it can’t be denied that it worked. To see the first-of-its-kind of anything is an exciting affair, so make sure to visit the Ayyappan temple if you happen to be in Chennai! Also, in the Mylapore area of Chennai, this sole temple for the devotees of the famous Shirdi Sai Baba stands proud! It was created by some of the biggest devotees of Sai Baba, a list that is too long to read out. In 1953, they put together the operation to construct this beautiful temple in the honour of their God. Sai Baba was a historic figure who lived in the 19th century and was renowned for bridging the gap between Hindus and Muslims because of his charitable outlook towards life. He has lived on in the country’s memory for preaching unity, a revered national sentiment. Come and get some blessings from Sai Baba at his southern abode! Being the capital city of the land of temples, a list of Hindu temples in Chennai can really just go on for a while. The temples mentioned above, however, are the most visited of the lot and it is for good reason. Not only are they beautifully constructed, but they also represent the city’s culture and its love for all things holy. Just like so many other important places in the country, this large city boasts of a heritage more ancient than the modern India itself.